Trumpet hero Arturo Sandoval, working on the concert grand. It was in 1979, when a young trumpet genius by the name of Arturo Sandoval hit the stage at the Auditorio Nacional in Mexico City, along with the other members of the Cuban group Irakere, which by now is music history, people looked at them in disbelief. The performance delivered by the Cubans was nothing less than an explosion. The sounds hitting the stunned audience could be described as a hurricane of Afro-Cuban-Jazz-Rock of a kind nobody in the hall had ever heard before. It felt like a Cuban version of Earth, Wind Fire, like a tsunami of music from a parallel universe, which could not have been more energetic. I was 13 years old, sitting in the audience and staring at the stage, like in trance, and did not notice anything else around me, when Arturo and the other trumpet player in this 12-piece band, Jorge Varona, started their first trumpet battle. Arturo went higher and higher, who knows how many octaves he covered. All of them, Arturo, Jorge, Enrique, Chucho, Oscar, the two Carlos’, yes everyone, played their asses off. These fireworks of music were something I would never forget. A few years later, when I was still a teenager, we were in Havana. I was sitting in an elegant hall, belonging to a luxury hotel, when Arturo hit the stage, this time with his own band. Those were the times when “Turi” was recorded, an album produced at EGREM, Cuba’s state-owned record label. Again, Arturo pulled it off, stunning his audience. Twenty years later, in Germany, I attended another two gigs of his and interviewed him afterwards, for a radio station. His escape from Cuba, the “Flight to Freedom” he named a GRP album after, had just happened a few years before. He talked about Castro, the dictator, but also about Chucho and the guys, he would always be ready to play with. 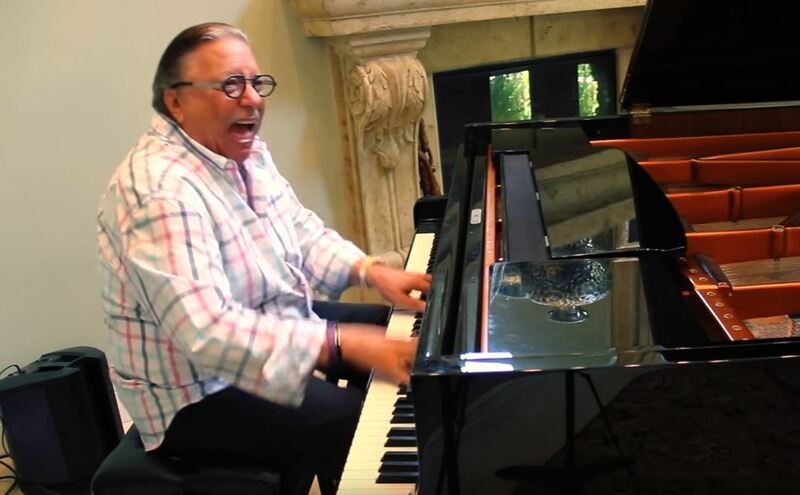 He lived in Miami by now, after an ordeal described in the HBO movie “For Love and Country: The Arturo Sandoval Story”, in which Arturo was portrayed by Andy Garcia. A defection would have been easy for a travelling musician, had he not fallen in love in Havana, with a lady who believed in the revolution. They defected anyway. It took years until the United States finally granted him the citizenship he had fought for so hard. Washington politicians finally made it happen. Arturo Sandoval did not need to be discovered, since he was already a genius on stage, when the late Dizzy Gillespie came to Havana. Dizzy discovered him anyway, they toured together, and Dizzy helped him defect. There is always some kind of surprise, e.g. when the trumpet master sits down behind the concert grand and plays it like a God as well. A happy 67th birthday to the energetic master, the Cuban trumpet genius, the guy who almost made me faint in 1979.